Grilling recipes are wonderful in the summer because most of the time there is little prep work involved. With some advance planning for marinating, we often toss a marinated flank steak on the barbecue to enjoy. 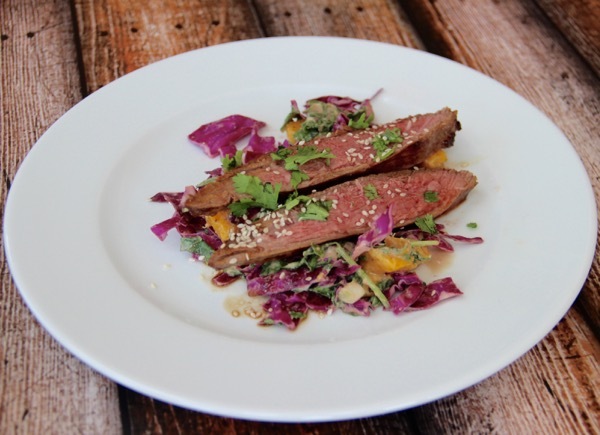 This particular recipe is packed with flavor and I know a handful of our readers out there have been waiting for some healthy meat based entree recipes. Kale is rich in vitamins A, C and K and folic acid, as well as calcium, potassium, copper and iron. These nutrients are necessary for healthy bones, skin and eyes. Flank steak is a lean, flavorful, boneless cut of beef. Mix marinade ingredients in a small bowl and pour into a large Ziploc bag or glass baking dish, add flank steak and marinate in the refrigerator overnight or for at least 6 hours. Combine the dressing ingredients in a small bowl, whisk to blend and set aside. Combine salad ingredients in a large bowl and drizzle with the dressing and toss to coat. Remove the steak from the marinade and discard the leftover liquid and grill the steak, turning once, until it reaches desired doneness (about 6 minutes per side). Let the steak stand for 5 minutes and cut across the grain into thin slices. 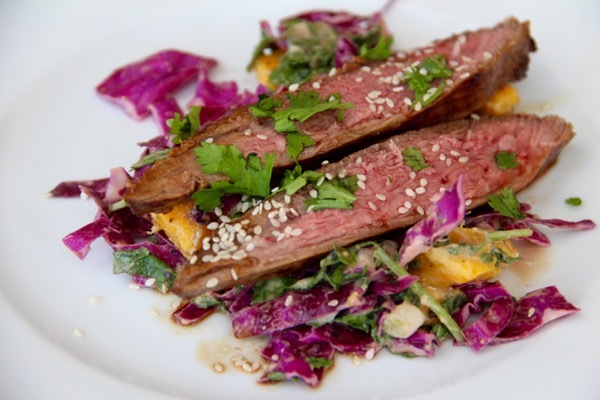 Divide the slaw evenly among plates, drape the steak slices over the slaw, sprinkle with sesame seeds and enjoy!